Kent’s $50 Innocence DVD Scheme; How It “Works”! – Kent Hovind v. Robert Baty – The Great Debates! Home→Kent’s $50 Innocence DVD Scheme; How It “Works”! Kent’s $50 Innocence DVD Scheme; How It “Works”! 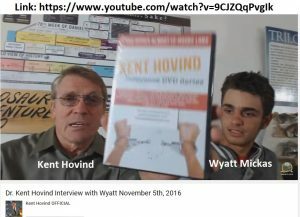 Today Kent Hovind revealed some more of the still-kept secrets regarding his proposed scheme that he claims could result in the overturning of his 2006 convictions and the awarding him of up to $30,000,000.00 in damages. Get that “Innocence DVD” , and for you folks in Wyatt’s listening audience, I spent nearly 9 years in prison, federal prison, for nothing, for not breaking any single laws at all. Give me one of those DVD packs, Dan. Brady did all kinds of research on my case and, 15 months. I did not break any laws. The government broke a lot of laws to put me in jail. And there is still a way to get that overturned and get paid for damages. It’s part of my life now. They locked me up for 9 years. Anybody Googles my name is going to find it. There is a website, “kenthovindisinnocent.com”. I wrote a book while I was in prison called “The Kennel”. This is about the prison complex. It’s unreal. This is a money-making racket. Judges, congressmen, senators own stock in the prison system. And the more people they lock up the more money they make. It’s insane. America’s got the largest prison system in the world. The “land of the free” has the largest prison system on the planet. What is wrong. Anyway, you get “The Kennel” and the video series, $50, call 555-BIG-DINO and you can get that. Brady, you are sitting here tonight, the only one in the audience. Your work you did on the case is phenomenal. The first letter has gone in, if I understand, and that letter goes to Congress and to the head judge requiring them to start an investigation, initiate impeachment proceedings and, what if they don’t. They will have to bow to public pressure. So, we need a lot of people, hundreds, thousands of people; at least hundreds of people; if you would just do what’s on DVD #8 of your series. Watch the videos and say “WOW, what an injustice”. The real criminals that broke 17 laws to put me in need to be investigated. The FBI is getting a lot of pressure to investigate Hillary Clinton. They should investigate. If she has nothing to hide, she has nothing to fear. Gideon had 300 men who said, “Let’s go get ’em”. Let’s do that; get 300. So, get that “Innocence DVD”. It sounds to me like Kent is anxious to keep his secrets until he can get as many people as possible to send him $50 for the actual details before having to release the details publicly and potentially end his lucrative money-making scheme. The “kenthovindisinnocent.com” website advertised as a source of information in the video and on the DVD packaging appears to be “parked” and there is nothing there, currently, to inform anyone of anything regarding the scheme. So, we continue to wait for further details to unfold. Other articles have already been posted here showing the false and/or misleading claims made for the scheme and the unlikelihood that Kent Hovind has any reasonable hopes that anything can be done to reverse his 2006 convictions and get the government to pay him millions based on “false imprisonment”. There are many other articles on this website related to Kent Hovind and his legal/tax and related issues. supply and they use you up. and tried to distance yourself from that. further promote himself and his false legal narrative. broadcast it at all or taken part in any such event. to bring it up and promote it? debate with atheist Dave Foda? the related version broadcast by Kent.